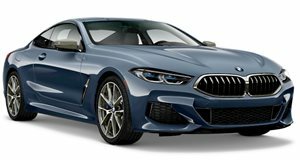 After an almost 20-year hiatus, the 8 Series coupe has returned with the M850i xDrive Coupe M Performance set to hit the market in November of this year. Power comes from a 523-hp 4.4-liter twin-turbo V8, sent to the tarmac via an AWD system and an 8-speed transmission. Performance and handling promise to be class-leading thanks to a comprehensive list of M Performance components such as a lockable rear differential, CFRP body construction and M Sport suspension and brakes. Standard equipment includes the latest Head-up Display and Live Cockpit while available options like the Driving Assistant Professional, Bowers and Wilkins audio system and active climate-controlled front seats raise the luxury and tech levels to new heights. The BMW range has been growing exponentially over the past decade. While the proliferation of new niche models has undoubtedly expanded the brand’s appeal, is a car that draws on the company's well-established luxury sports car expertise. It is a replacement for the capable yet aging 6 Series range and brings with it much-improved dynamic ability and the latest technological systems available. The M in the M850i xDrive the name does not stand for marketing either. There are comprehensive mechanical and exterior changes that justify the tag, including an M Sport braking system, 20-inch alloy wheels with mixed-size tires, front spoiler extension to minimize front-end lift, large air intakes and an M-style rear spoiler. Aesthetically the slim front and rear LED lights add a menacing and modern look to the package. The fronts can additionally be upgraded to the recently introduced Laserlight system. The unique central cut-out in the roof section, heavily raked rear window and twin trapezoidal tailpipes further underline the sporting intentions of this big coupe. An M carbon roof and M carbon exterior package comprising of CFRP spoilers, diffuser and intake slats will also be on offer. The M850i xDrive uses an updated version of the now familiar twin-turbo 4.4-liter V8 that does duty in a number of high-end BMWs. In this iteration it pushes out a very strong 523-hp along with 553 lb-ft of torque. That is an increase of around 80-hp over the V8 650i xDrive and thanks to newly developed twin-scroll turbochargers, optimised direct injection VALVETRONIC and double-VANOS systems. Exhaust gases are kept compliant with the latest emissions regulations via a gasoline particulate filter. The power is put down to all four wheels through an 8-speed automatic transmission and despite weighing in at 4,478 pounds, all-wheel-drive traction rockets it to 60 mph in 3.6 seconds. This kind of performance lets it easily outpace the outgoing 650i xDrive and puts it level with some very fast sports coupes. 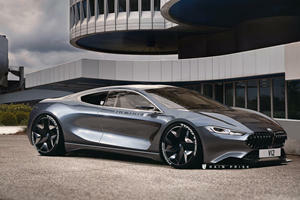 The upcoming M8 with its 600-hp M5-shared powertrain is sure to raise the power levels to a whole new level. There are plenty of overpowered luxury sportscars out there though, both Audi and Mercedes offer pavement-shredding AWD rivals. But the USP of most powerful BMWs has been their ability to outperform rivals in dynamic ability. To this end the 8 Series was developed in parallel with the M8 and M8 GTE endurance racer. It benefits from a low center of gravity, well-balanced weight distribution, virtually lift-free body and a very stiff body and suspension structure. The lightweight body utilizes aluminium, magnesium and carbon-fiber-reinforced plastic similar to the carbon core used in . The M850i xDrive also comes standard with an Adaptive M suspension system, integral active steering, rear-axle differential lock and a sports exhaust system. Active roll stabilization will also be an available option. Clearly this luxury GT is much more than just a boulevard cruiser but it is more than capable of cossetting its occupants in total luxury when required. The driver-controlled driving modes promise to deliver even more pronounced differences between modes. Steering effort, chassis characteristics, engine responses and exhaust sounds can all be adjusted between the Eco Pro, Comfort and Sport/Sport+ settings. From advanced ambient lighting features and the very best interior materials, 8 Series owners will also be able to choose from a range of upgrades like the newly designed climate-controlled front seats and glass-design control finishes. The iDrive controller, start/stop button and gear selector can all be optioned with this unique glass surface. Audiophiles will be very well-catered for too; the standard audio system comprises of eleven speakers and a digital amplifier but an even more impressive sixteen speaker Harman Kardon Surround Sound System will also be available. For the true enthusiast a superb 1,375-watt Bowers & Wilkins Diamond Surround Sound System can also be specified, offering class-leading performance from its sixteen-channel active amplifier and diamond loudspeaker technology. Technology in all areas has taken a major leap forward. A standard Head-up Display and the digital BMW live Cockpit Professional system offer the very latest in customizable driver information while the long list of optional equipment includes notable items like the Driving Assistant Professional, which incorporates steering and lane control as well as active cruise control to offer semi-autonomous driving. Wireless charging and a Parking Assistant add further to the list of conveniences on offer. The BMW Digital Key works on a (NFC) Near Field Communication system which allows you to use your smartphone to access the car instead of a conventional key. Over-the-air software updates and BMW’s Connected App system will also be available. Now in this highly competitive market there are cars that offer a similar spread of talents, but the 8 Series brings its own unique blend of attributes to the segment. Sporty coupes like the Mercedes AMG S-Class Coupe and AMG GT cover the ultra-luxury and track-focused spectrums respectively. The evergreen Porsche 911 also leans towards the sportier side so it is perhaps the multi-talented Lexus LC500 that comes closest in execution. Final pricing will be announced at a later date and we expect a small increase over the current 6-series range. The 8 Series coupe will be followed by and Gran Coupe body styles in due course and the hotly anticipated M8 should also make its way to the States. 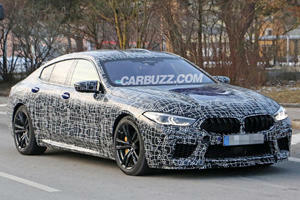 M3 + M8 Gran Coupe = M11? No, but it does equal over 1,000 hp. BMW hasn’t built a proper mid-engined supercar since the mighty M1. 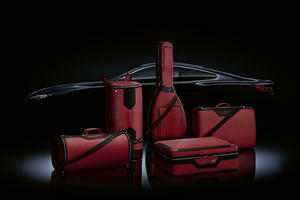 Montblanc will only make 15 sets, and they ain't cheap.